a 64 year old type-II diabetic presents to ED at 3am with ongoing severe knee pain & fevers. She has been on high-dose non-steroidals for the past 8-9 days for a presumed diagnosis of ‘gout’ by her general practitioner with minimal improvement in her symptoms and was seen in your department 48 hours earlier for ongoing pain. 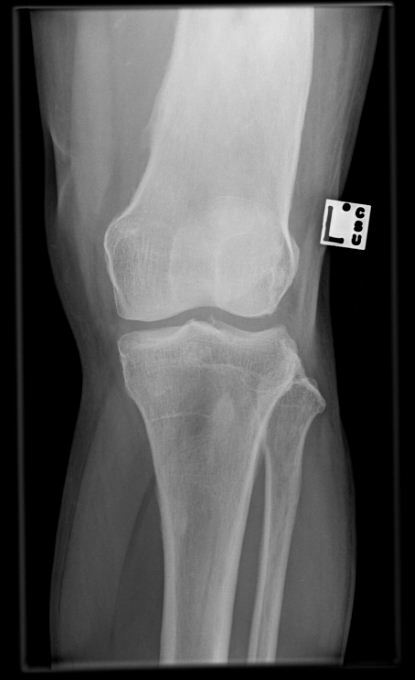 During this visit she underwent left knee arthrocentesis which failed to show crystals. Gram stain & subsequent cultures were negative. On examination today, she is febrile to 39*C and tachycardic at 120 per minute. 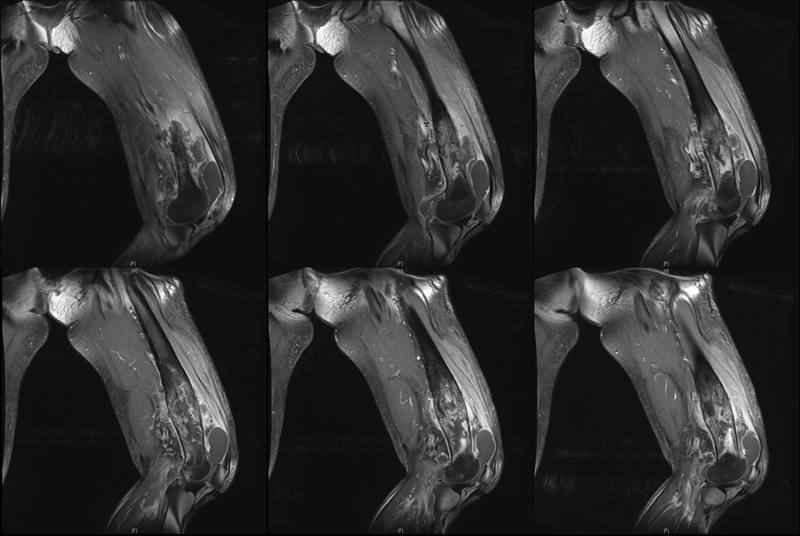 Her left knee appears unremarkable on inspection [no erythema, effusion, oedema etc], with the exception of a moderately sized ‘dimple’ on the medial aspect of her distal thigh. She explains that this is a result of an injury sustained in childhood. As you are further examine her knee’s range of motion, you grab her distal femur which feels unexpectedly ‘swollen’. She winces in pain as this happens…. 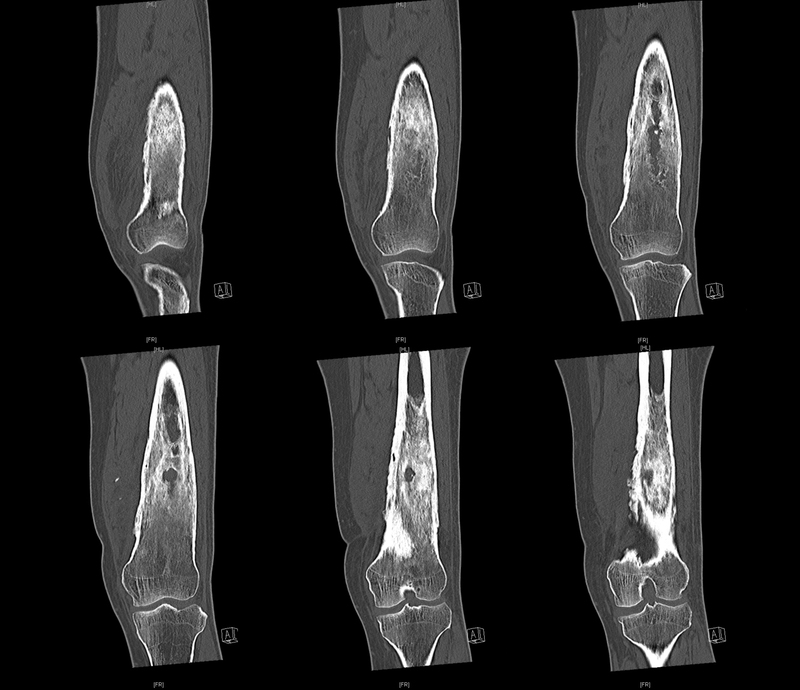 Abnormality of the distal femur with bony deformity, periosteal reaction & sclerosis. a suggestion of central cyst formation or necrosis. What is your next move…? Her full blood count reveals a white-cell count of 17,000. CRP has climbed to 440. With the ongoing fever, she is commenced on empiric flucloxacillin ! She is admitted under Orthopaedics with arrangements for advanced imaging…. An infection of bone by resulting in bony changes & destruction. ~80% contiguous spread from adjacent infection or direct inoculum post-trauma/injury. Children – typically long bones. Adults – typically the spine. RISK FACTORS & ASSOCIATED ORGANISMS. Salmonella – assoc. with Sickle cell disease. M. tuberculosis – migrants, immunosuppressed. Bone biopsy: required if blood cultures negative. In chronic infection; sinus cultures may be misleading. Consider alternate diagnosis if cultures are persistently negative, however continue anti-staphylococcal therapy during further investigation. 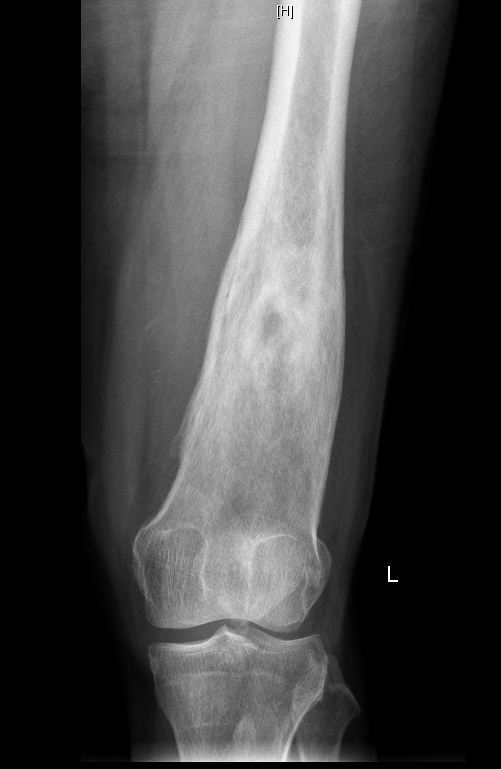 ESR > 70mm/hr in a diabetic = Sn 83-92% for osteomyelitis [from one reference]. Early changes are subtle, but may not be obvious until 7-14 days into illness. Sequestrum or involucrum may be seen in cases of chronic osteomyelitis. Superior to both MRI + plain x-ray is depicting bony margins & identifying sequestrum/involucrum. Currently the imaging modality of choice. Most sensitive (95%) + specific. 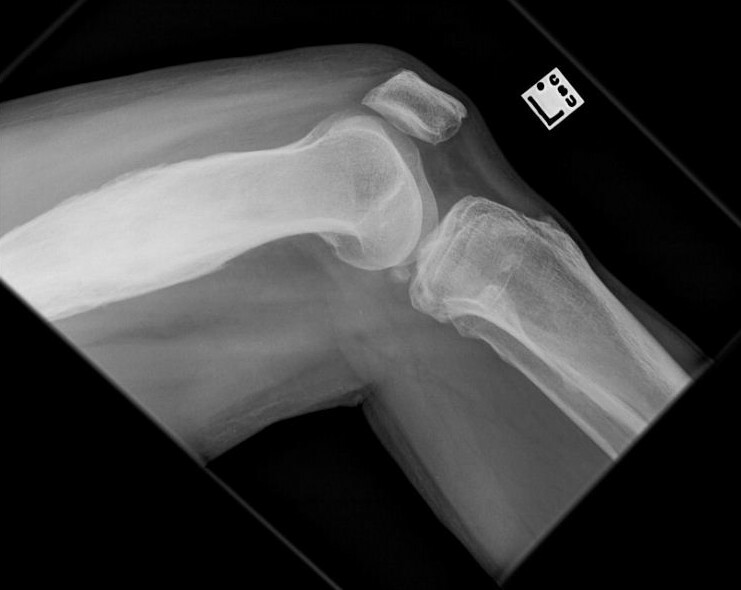 Able to identify soft-tissue/joint complications. Ultrasound – allows easy drainage of soft-tissue collections, but little direct benefit in cases of osteomyelitis. Nuclear medicine – including Gallium & Technetium studies. Flucloxacillin 2 grams [or 50mg/kg in children] IV q6h. Cephazolin [same dosage] for penicillin hypersensitivity. Vancomycin 1.5 gram IV BD [30mg/kg in children]. Adjust for renal function. Gram-negatives, including patients with indwelling lines. Tazocin [Piperacillin/Tazobactam] 4.5g IV q8h. Adjust for renal function. Neonates: 4 weeks (IV) total. Children: 3 days (minimum IV), 4 weeks (total, minimum). Adults: 4 weeks (IV), 6 weeks (total). Children + adults: months !! Adults require at least two weeks IV. 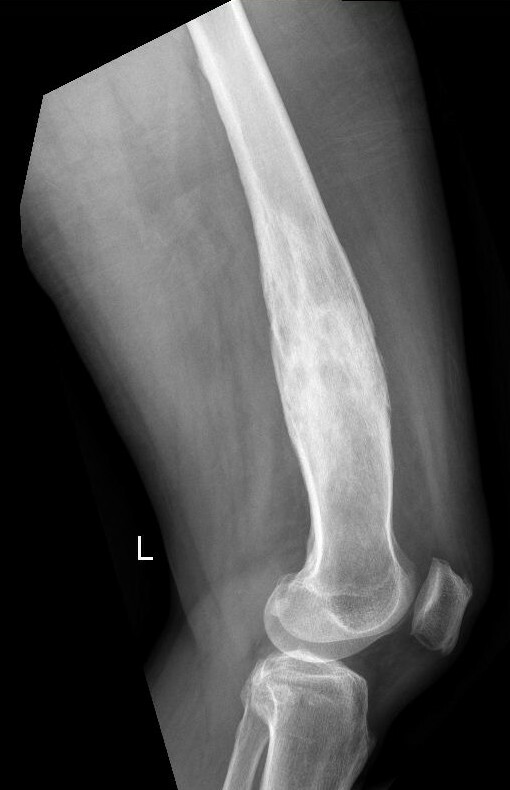 The above images were diagnostic of chronic osteomyelitis, thought to be secondary to her childhood injury. After a 7 days as an in-patient, she is discharged home with ongoing IV antibiotics continuing with community nursing. Tintinalli’s Emergency Medicine: A Comprehensive Study Guide. 7th Edition. Osteomyelitis – Therapeutic Guidelines (eTG) via CIAP.